The fish are biting and its now warm enough where you don't see your breath when yelling "Fish On!". 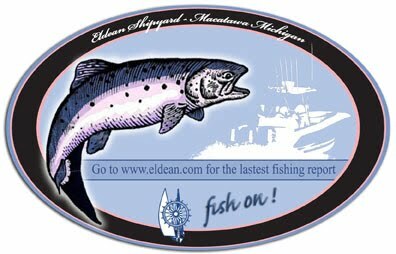 There have been a lot of Browns, Lakers, and Coho being caught right now. I've heard that the beach has been good for browns. We headed offshore yesterday afternoon and fished from140 to 190 and ended 5 for 6. We caught 4 nice coho's in the 3 to 5 lb range and a 4 lb laker. The surface baits didn't have any action and everything came on downriggers 50 - 90 (coho) and the laker near the bottom. It was sunny and flat. A great first trip out!